Junghyesa Temple, in Anaheim, held various events on January 21st to celebrate the day Shakyamuni Buddha was enlightened which is the most meaningful day for Buddhist followers. 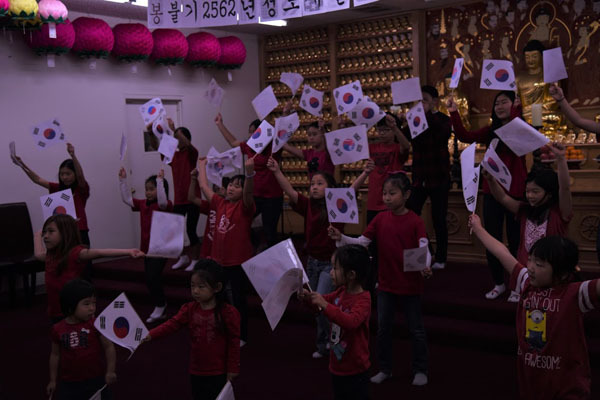 The entire family of Junghyesa Temple from pre-school children to students, young adults and adults all joined in the two-part event, consisted of a commemoration ceremony and an art festival, to celebrate the grateful day and to uphold a request by the abbot, Ven. Seokta to remember the significance of Bodhi Day and practice arduously. During the art festival, the members of Junghyesa Temple demonstrated their talents by participating in performances for which they practiced after every Sunday ritual ceremony. Ven. Hyangeom praised the effort of the performers stating that “the participating audience was able to enjoy a wonderful time thanks to the efforts and time instructors, leaders of the temple community and members have put aside for the performances from their busy life.” The event was a special opportunity for the members of the temple community to reflect on how to study the teachings of Buddha and how to share the teachings with their neighbors.